Hey guys! Hope you are having a great weekend! Yesterday I went veggie crazy at the farmer’s market, per usual. 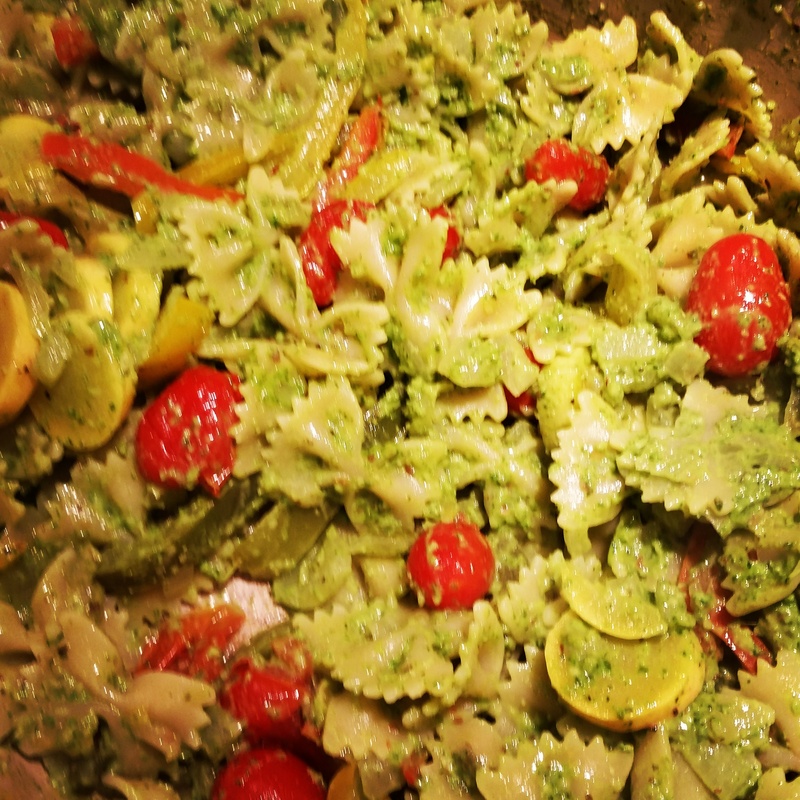 I concocted this veggie pesto pasta using all my farm fresh ingredients. You could throw in some grilled chicken or sauteed shrimp in at the end. Pasta Perfection! Pesto- There is nothing like a summer fresh homemade pesto! Original pesto has basil, pine nuts, garlic, and parmesan mixed with olive oil. I like to play around with my pesto, so here is how I made it this time. 2 cups packed greens- 2 good handfuls of mixed greens I got from the market; spinach, arugula, romaine, and kale. 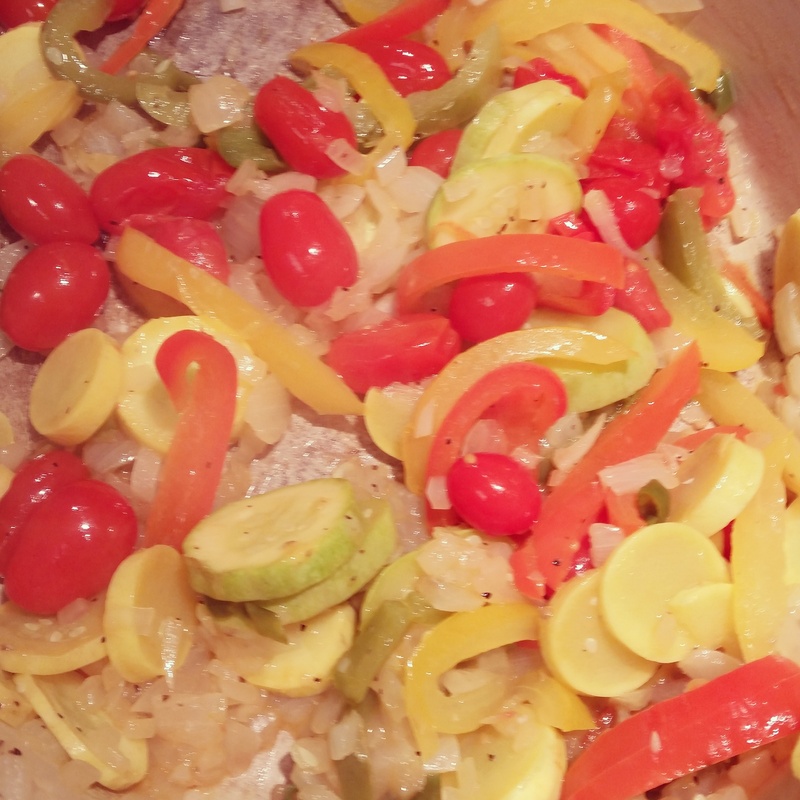 I sauteed a chopped onion, a handful of cherry tomatoes, 1 sliced squash, sliced sweet peppers (1/3 each of red,yellow,green), and 1 sliced jalapeno. I added 1/2 box of bow tie pasta (use whatever kind of pasta you have/like) to the veggies. Save some pasta water. Add a few tablespoons of your pesto. Add in a bit of pasta water. Mix well. With all those beautiful colors and flavors, this pasta looks and tastes just like summer! Thanks so much! I will take a look at your blog, too!